Alien: Covenant didn't wind up being the franchise saving mega-hit that everyone hoped it would be. It was fairly divisive among fans and didn't do nearly what Fox was hoping it would at the box office. 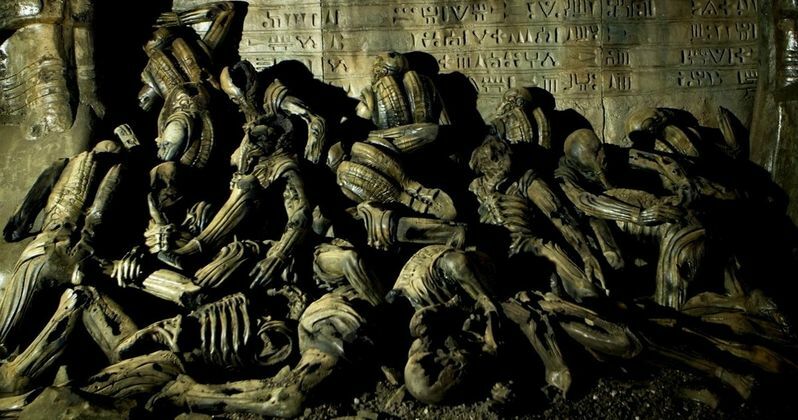 Still, the movie did add quite a bit to the Alien lore and one of the newly revealed deleted scenes from Alien: Covenant, which is to be included on the upcoming Blu-ray release, showcases a little bit more of that lore and what happened to the Engineers. Warning: spoilers ahead for Alien: Covenant. In the movie, it is revealed that Michael Fassbender's David decided to use the Engineer's dangerous biological weapon against them and unleashes it on the planet that the Covenant crew unwittingly lands on. This attack wipes out the population of Engineers on the planet. In this newly revealed scene, courtesy of The Hollywood Reporter, we get to see a little bit more of the aftermath of this attack a decade later through the eyes of the Covenant crew. The scene takes place just after David rescues everyone from the Neomorph attack, which wound up destroying their landing vehicle and claiming the lives of several members of their crew. While following David to his hideout, they walk through the Engineer graveyard and take it all in, wondering what happened and what caused this devastation. Little do they know it is actually David who did this and has plans of his own for the unsuspecting humans he just rescued. We see bits of this sequence in the movie, but seeing it extended like this really helps give a sense of the devastation that David was able to cause with his attack. This is just one of many extended and bonus scenes that are going to be released when Alien: Covenant hits home video. Other scenes that fans can expect to dive deep with include Prologue (Extended), Walter in Greenhouse, Oram and Daniels (Extended), Walter Visits Daniels, Daniels Bedroom Flashback (which will likely include a little more of James Franco), Jacob's Funeral (Extended), Ledwards Fall, Crossing the Plaza (Extended), Daniels Thanks Walter, Rosenthal Prayer, Walter Reports Back and Stairs to Eggroom (Extended). For those that liked Alien: Covenant, that is a whole lot of reason to pick up the Blu-ray. Though, it is disappointing to see that there aren't any Elizabeth Shaw deleted scenes. Fox is releasing Alien: Covenant on digital platforms on August 1, with the movie set to arrive on Blu-ray/DVD and 4K on August 15. Since Alien: Covenant has only made $232 million at the box office, it will need all of the help it can get from home video sales to ensure that Ridley Scott gets to make his proposed sequels and finish telling his prequel story. As it stands, the studio is reportedly unsure of how to proceed with the franchise given the mixed response and less than stellar box office performance of this movie. Be sure to check out the extended scene from Alien: Covenant for yourself below.